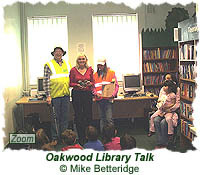 On the 30th of May, FGVW Core Group Member Mike Betteridge represented the Group by giving a talk to children at Oakwood library. About 15-20 kids turned up with assorted adults. Mike discussed the Friends Group, litter, bird boxes and squirrels. The children also had a wildlife quiz identifying birds, plants and trees, butterflies, etc.